Liquid Tape Wire Coating- This product has thousand of uses around the home, boat, RV as well as industrial uses. Anytime you expose electric wires to harsh environments you need this product. 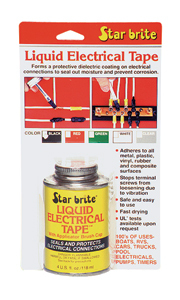 Liquid Electrical Tape provides a totally sealed joint which is flexible and fire resistant. UV and water and most chemicals will not affect a joint sealed with Liquid Electrical Tape. Dries to touch in about 10 minutes and fully cures in 24 hours.